Earlier this year, Apple announced that as part of an effort to power all of its data centers with 100% renewable energy it would be building a second 20-megawatt solar farm a few miles away from its new Maiden, North Carolina data center. The new solar farm would complement the previously announced 20-megawatt facility that appears to be nearing completion directly across the street from the data center. The location of the second solar farm was not immediately revealed at that time, but the Hickory Daily Record now reports (via 9to5Mac) that Apple has just purchased 200 acres land for the solar farm at a cost of $3 million. The plot is located nearly 15 miles from the data center and is being co-located with a new North Carolina Data Campus designed to attract other companies in need of data center capacity. The Conover site is the only other property Apple now owns in the area in addition to the main data center campus and solar farm in Maiden. With the two solar farms and a bio-gas-powered 5-megawatt fuel cell installation, it will be the largest non-utility installation in the country, according to Apple. The company expects to generate 124 million kWh a year, which would power the equivalent of 10,874 homes, Apple says on its website. Several local governments have banded together to create the new North Carolina Data Campus, which has purchased an additional 55 acres for its purposes at the site. Facebook and Microsoft had reportedly looked at the site as a potential data center, but ultimately selected other locations due to a lack of existing infrastructure. The new data campus entity will work to provide the necessary infrastructure in order to make the site more appealing to other companies. Unfortunately, they used the Maps app on iOS 6 and accidentally placed the solar panels on Neptune. Solar? What a bunch of wimpy liberals. Can't wait to see how many acres of forest will be bulldozed for Apple's next "green" energy source. Do your homework so you don't appear to be stupid. I drive by the site on my way yo Atlanta on a regular basis. Much of the site was fields. The number of trees that came down was minimal. The yellow outline is what Apple bought. Many of the trees are still there. what a waste of land space. Probably very similar to the way it operates at night. The DC is connected to the main grid and Apple will get most of its energy from the Grid. Just at sunny times the solar facility will generate much more energy than the DC needs so Apple will sell that energy to the utility. It will net out that Apple runs only on renewable, but most of the time (all night and during cloudy days) it will not be running on electricity generated by the solar facility. Well said. Mostly for publicity, I assume. That's got to be a *itch to mow, having to get under all those panels. It's ok. Apple is used to hiring below minimum wage non-Americans for everything else. This should be no different for them. Nuclear would have been nice (totally weather/sunlight independent). You know how much fossil fuel US aircraft carriers and submarines they themselves burn in their decades long service life? 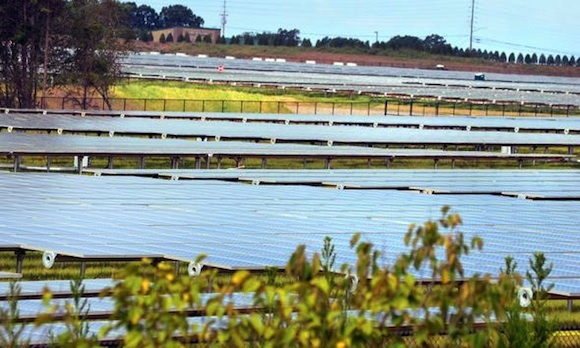 again what morons at apple, putting a huge solar farm in north carolina. because NC has low sunshine this means to get the same amount of power as would be obtained in arizona, they had to double the size of the solar farm.